This unique offering, designed for executives and their significant others, acknowledges that pressures of work and home are often competing. 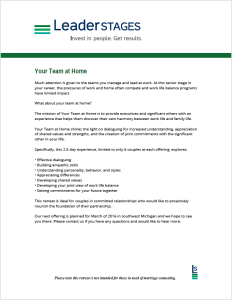 Your Team at Home shines light on developing greater understanding, shared values, and a future plan with the significant other in your life. *Limited to 6 couples at each offering. « For more information, download our PDF information sheet.